Maybe it's their color palette, ranging from chartreuse to nearly black, with rainbow stripes thrown in for good measure. Or maybe it's their enormous size. For whatever reason, canna lily (Canna spp.) leaves look too appetizing for an assortment of hungry bugs to ignore. Whether grown as perennial garden fixtures in U.S. Department of Agriculture plant hardiness zones 7 through 10, or as container plants overwintered indoor elsewhere, cannas are likely to host at least one of these unwelcome diners. The good news is that all of them are manageable with planet-friendly methods. 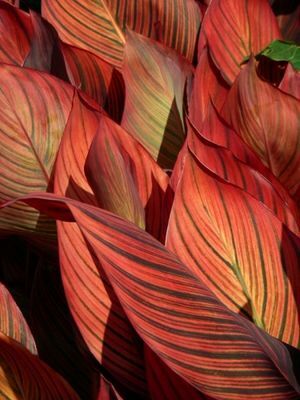 Larger canna leaf rollers pull the edges of the leaves over themselves. Lesser canna leaf rollers typically infest canna leaves before they unfurl. 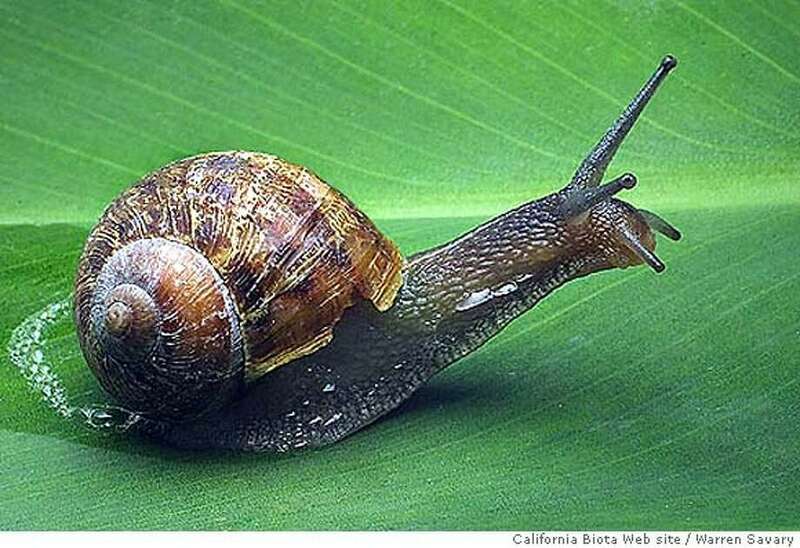 Both pests stitch their shelters shut with silk threads; the unfurled ones never open. Lesser rollers eat only the inner leaf-tissue layer, while larger ones eat the entire leaf. Pale green, white-striped celery leaftiers -- also known as greenhouse leaftiers -- fold part of a leaf, bind the folded sections with fine webbing and feed inside. Affected leaves have ragged holes. Rows of holes on newly opened canna leaves are the work of cream-striped, yellow, green or black corn earworms. 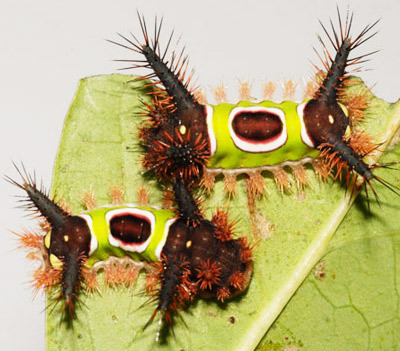 Venomous bristles and brown-and-white bull's-eyes on their bright-green backs make saddleback caterpillars hard to miss. 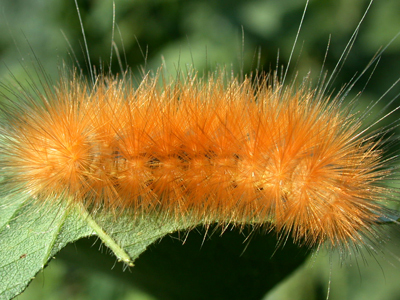 Other once-in-a-while visitors are fuzzy saltmarsh and white, yellow, or red-orange woolybear caterpillars. For cultural control, prune rolled or folded leaves as soon as you notice them, and dispose of them in sealed plastic bags. 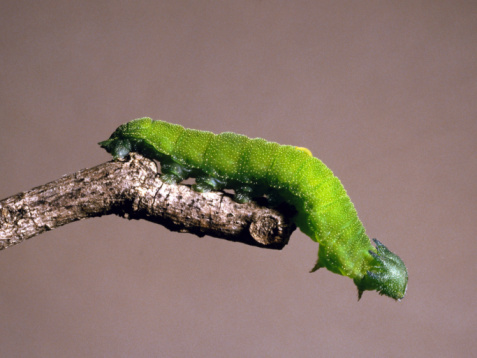 Hand-pick surface-feeding caterpillars and drown them in soapy water. Organic Bacillus thuringiensis var. 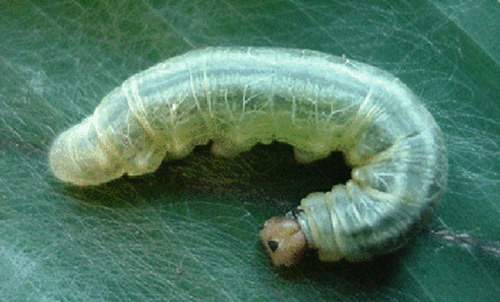 kurstaki spray kills caterpillars by disrupting their digestive tracts. It's most effective right after they hatch. Treat the plants with a solution of 1 tablespoon -- or the label's recommended amount -- of Bt concentrate diluted in 1 quart of water. Spray until the solution covers both sides of all the leaves. Time the spray for early morning or late evening, when no bees are likely to visit the cannas for at least three hours. Repeat the treatment as needed while the caterpillars are hatching. Aphids, mealybugs and armored scale insects occasionally attach to canna leaves and drain their sap. Aphids and mealybugs also drench them with gooey, clear waste. Blasting the leaves with hose water dislodges the aphids and mealybugs. 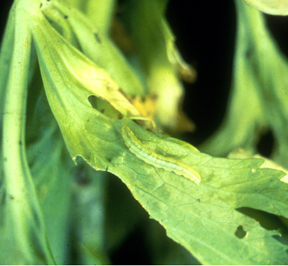 Scraping scales off with a soft toothbrush damages their plant-piercing mouths so they can't reattach. Between late spring and midsummer, iridescent, emerald and copper Japanese beetles often chew canna leaves to ribbons. Hand-pick and drown the earliest arrivals in soapy water before they release mate-attracting pheromones. If that isn't enough, spray with organic, ready-to-use neem oil. Coat the plants until the oil drips from them, and repeat weekly while the beetles feed. Watering in the morning so the plants dry by nightfall. Removing weeds, trash, rock or wood piles or anything than might shelter the pests during the day. Placing a board atop two runners to make an open-ended shelter near the cannas. Lift the board early in the morning and scrape the pests off into the trash. Raiding the canna bed by flashlight at night to hand-pick the intruders and drown them in a bucket of soapy water. Wear gloves while doing this. When only bait will manage the problem, consider slow-acting, kid-, pet- and wildlife-safe iron phosphate. In the early evening, moisten the areas around likely hiding places and along the trails the pests use to reach the cannas, then sprinkle them with the bait.